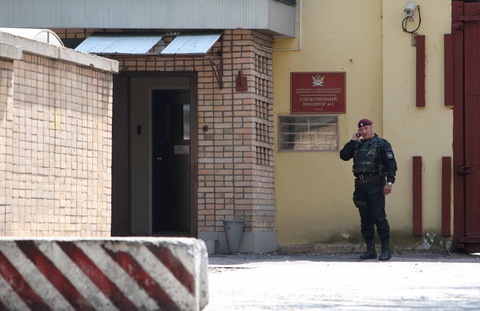 A Russian officer guards an entrance to Lefortovo prison in Moscow on Thursday. Photo by Alexey Sazonov/AFP/Getty Images. Armored vehicles arrived Thursday morning at a Moscow prison in preparation for what could be the largest spy swap with the United States since the Cold War. The Associated Press reports that Lefortovo prison has become a gathering point for people convicted of spying for the West, including nuclear researcher Igor Sutyagin, who is serving a 14-year sentence for spying for the United States. Sutyagin’s brother and lawyer told media organizations that he was transferred to Lefortovo earlier this week to take part in the swap and could be flown out to freedom as early as Thursday. Reports say that Sutyagin saw a list of 11 prisoners in Russia who are being traded for 10 people arrested in the United States for being unregistered Russian agents. Officials in neither country would confirm an exchange was planned. But a meeting in Washington between U.S. officials and the Russian ambassador on Wednesday is leading many to believe that a swap is in the works. A federal indictment against the 11 people accused of operating under deep cover for the Russian intelligence service was unsealed in a federal district court in Manhattan on Wednesday. NPR has the story here. The men — a Uighur from China, an Iraqi and an Uzbek — are all Norwegian residents and had been under surveillance for a year. Officials believe they were planning attacks with bombs similar to the ones in last year’s thwarted suicide attack in the New York City subway. On Wednesday, U.S. prosecutors unveiled charges against the five men wanted over that plot, which authorities believe al-Qaida’s core leadership planned. The Wall Street Journal reports that BP will try to plug its leaking well in the Gulf of Mexico by end of July. The effort would come “weeks before the deadline the company is discussing publicly, in a bid to show investors it has capped its ballooning financial liabilities, according to company officials,” the Wall Street Journal reports. Both BP and the Coast Guard continue to state publicly that they are aiming to have a fix in place by early to mid-August. Meantime, the Obama administration is expected to appeal to a federal appeals court in New Orleans on Thursday to reinstate a six-month deepwater drilling moratorium. The New Orleans Times-Picayune follows the story here.